Damon Vickers, Chief Investment Officer, World Renowned Investment Authority, Best Selling Author "The Day After the Dollar Crashes"
This week, Stephen Ibaraki, FCIPS, I.S.P., ITCP/IP3P, MVP, DF/NPA, CNP, FGITCA has an exclusive interview with Damon Vickers. 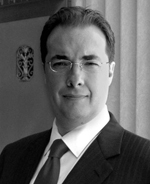 Damon Vickers as Chief Investment Officer of Damon Vickers + Co. is a renowned investment expert. Vickers has been a guest on CNBC, Bloomberg, and Fox Business Network (http://en.wikipedia.org/wiki/Fox_Business_Network). He has been cited or quoted in The Wall Street Journal, The Washington Post, and other financial and general-interest publications. His 2011 book, "The Day After the Dollar Crashes" appeared on The New York Times business best-seller list, and reached number 5 among business books at Amazon.com. Martin D. Weiss called the book "A must read," with Michael W. Covel commenting "Damon Vickers wants you prepared for an unpredictable future. Are you? If not, time to wake up." :00:31: Damon can you profile some of the key roles and events in your life and perhaps some lessons that you've learned? "....I had the benefit of the values and experience of my great-grandmother and great-grandfather, and their beliefs and values are most certainly conveyed in our family and that is of service to the world and humanity...."
:04:09: What are some notable trends that people should be aware of? "....One of the biggest things facing us today is the relationship between government and people. I think government needs to quickly assess its relationship to the general population around the world because the people of the world and their power are growing faster than the government's ability to control them. This puts governments into a fearful state because governments want to perpetuate themselves...."
:13:26: What do you see as the key disruptive force out there and why? "....There really aren't the borders or boundaries that there used to be....What the world needs right now is a new belief system that can be embraced globally by all people at the same time, and in so doing they begin to share a heritage, a new culture, a new definition of themselves not as people who are separate, but as people who are one...."
:15:41: What do you see as the top opportunities (in a business or a social context) out there that people can engage in? "....The opportunity on a social sense is we have enough enlightenment and knowledge to know that the type of world we'd like to see is possible in our lifetime and that is a world of peace, harmony, kindness and compassion — not just from man to man, but man to all life...."
:21:31: Looking at it from an external point of view and looking at the world around us, outside of the areas you've already talked about, what do you see as areas of controversy that we should be engaged in? "....The idea of creating one world is viewed as being something that some people are afraid of....The concept that you're going to stop slaughtering fish and animals for the purpose of your diet or the immediate gratification of your taste buds — that's a hard one to fight I suppose....There's too much unfocused energy on a global basis right now. What we need is more unity and common work...."
:27:07: Some of the social issues that have to be addressed, how that ties into humanity and having acceptance and sort of a unification of everything that's on the planet; do you see technology playing a role in that in some way? "....The real question is: what is the real value of technology and its service to people?....It's finding balance which is very important...."
:31:20: You successfully predicted the internet bubble of Y2000, real estate bubble in Y2007, and financial crisis in Y2008. "....I did not predict, I made money from it....In the years leading up to the 2000 dot com meltdown, we were very long to market so we just simply changed course, we adapted, we flowed, we were fluid, we changed — which is what we do...."
:32:08: I guess this applies to the real estate bubble in 2007 and the financial crisis in 2008. What key methodologies or processes do you use to prepare for some of these things that are happening? "....It is very important from an investment standpoint to try to manage change....I don't think it's predicting as much as I see a change and I seek to position our money and our investments in the path of that change and that's something that we've always done...."
:37:08: What was your main objective in writing the book "The Day After The Dollar Crashes"? ".....As I was writing the book I increasingly came to realize that it was one thing to see things and to see this change coming, but it was also important to begin to articulate some ideas and to begin putting forth some direction. In my humble, not so articulate way I put some of those thoughts in the book so that the world could just have the beginning seed of what was possible. I'm happy that people have gathered...."
:41:19: What do you think are the fundamental economic changes 'after the dollar crashes' ? "....In recent years the destabilization of Europe has led to a stronger dollar. Until the dollar actually breaks a new price low which is going back to 2008 levels, we cannot say that the dollar is going to crash...."
:42:04: Let's say that it does happen, what would be the outcomes from that? How would things change in the world order? "....A rejection of all global governments, much of the world's religions — a lot of the coin of the realm of the world will be rejected. There will be a new coin of the realm, a new global infrastructure and there will likely be a new global religion...."
:43:18: Many economists pay strong attention to 'liquidity'; what are your unique views on 'liquidity'? "....Liquidity is generated by participants. Participants need confidence and understanding to participate. Liquidity, participation, commonality and unity are good. One world global marketplace of freely participating characters and players; all humanity truly trading with everyone is good. But we have to let go of our fears, distrust and we have to respect differences....We're moving in that direction now...."
:45:56: In your book, you mentioned: US people are always innovators, even if there are no jobs, US entrepreneurs must create job opportunities for the US. What do you think are the key differences between US entrepreneurs and their counterparts in emerging markets? "....It depends on which emerging markets you're talking about....Governments on a global basis are perpetuating their own power structure; this is why they are all in the process of failing and this is why they will fail....Have the courage, confidence and faith to be creative. Have a global government that at its very roots honors differences and the variety of thinking and practice and belief and thought. When we have this in place on a global basis we have a renaissance that may last thousands of years, and this planet and our culture and our global culture will take us beyond this planet and into the stars and heavens into the exploration of our universe where untold things and possibilities lie before us...."
:52:33: It’s interesting, your thoughts that perhaps everything is coalescing and going into this new world order. Do you see people who are under the pressure of financial crisis driving towards this new world order? "....The financial crisis is not financial crisis, the financial crisis is really the crisis of the spirit....The financial crisis was essentially created by the assumption of debt, which was assumed because we thought that things would satisfy us and things are not satisfying....The world is in a financial crisis because it was looking in the wrong box. The box that a person needs to look in is the box inside themselves (their heart, compassion and commonality)....What I'm talking about is the surrender of the self and that's a hard thing to do...."
:01:02:57: What are your feelings about all the economic things that are happening around the world, economic monitoring for governments and what does that mean to the investor? "....Change in society has always driven and always been the creator of the best performing companies and business on a global basis and will always be. What you need to be is perceptive enough, have your eyes open enough to see change. You have to be able to not project your biases because you can't see much if you already have ideas in your head. Sometimes you have to empty the ideas in your head and be a blank piece of paper...."
:01:08:05: Damon, from your extensive speaking, travels, and work, can you share some stories (amusing, surprising, unexpected, amazing)? "....This interview has certainly been interesting. I really had no expectations of it, which is good and I think that was the beauty of it...."
:01:09:14: Damon, do you have any additional comments or any questions that I’ve missed? "....The frontier is the human heart and to the extent that we make peace with that I think anything that we can conceive is possible and possible right in front of us...."
:01:10:18: Damon, with your demanding schedule, we are indeed fortunate to have you come in to do this interview. Thank you for sharing your deep experiences with our audience. "....Thank you very much. I had a great time...."